What will happen when I “Shop Local”? Small business accounts for 75% of all new jobs. When you spend $100 at an independent business, $68 returns to the local community. Spend that same amount at a national chain and it drops to $43. For every square foot a local firm occupies, the local economy gains $179 vs. $105 for a chain store. Locally-owned businesses reinvest in the local economy at a 60% higher rate than chains and Internet retailers. Small businesses employ just over half all U.S. workers. Small businesses create more than half the nonfarm private gross domestic product (GDP). Locally-owned and operated businesses create higher-paying jobs for you and your neighbors. Sources: U.S. Chamber of Commerce – Small Business Nation; Civic Economics – Andersonville Study of Retail Economics. Civic Economics – San Francisco Report on Retail Diversity. U.S. Dept. of Commerce, Bureau of the Census, Buy Local Berkeley. Are run by your neighbors—maybe even friends or family? They genuinely care about the well-being of your community because it’s their home too. Add character, quality and charm to your community, not to mention more choices? Often these smaller shops carry items that bigger stores don’t sell—usually because there’s not enough of the really good stuff to go around or the profit margin isn’t high enough for the big guys to stock. 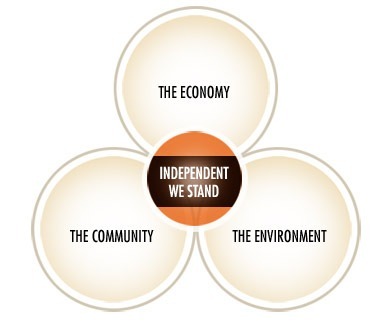 To learn more about Independant We Stand, please click here.